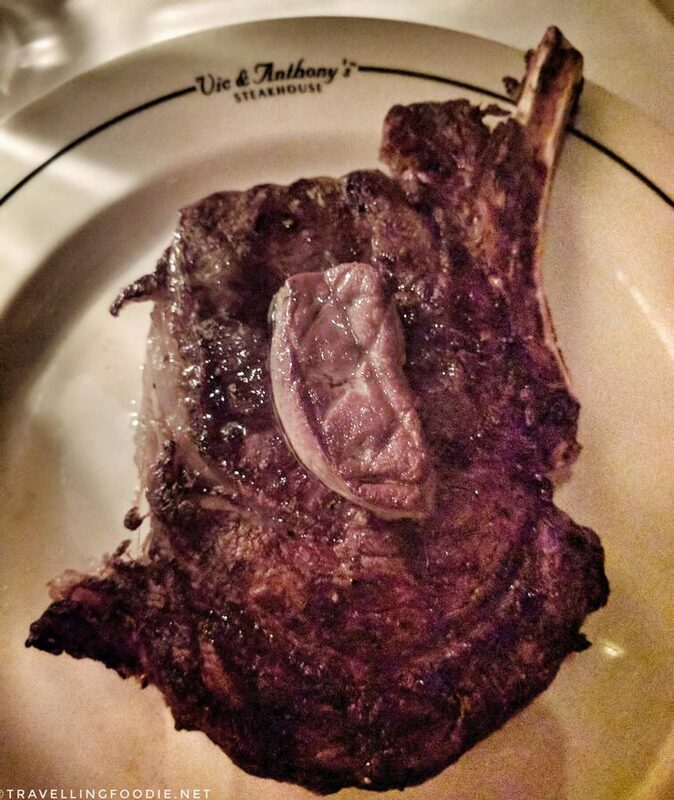 Vic & Anthony’s Steakhouse at Golden Nugget Las Vegas is the second location of the award-winning steakhouse from Houston, routinely voted one of America’s ten best steakhouses. It’s one of the fine dining steakhouse in Downtown Las Vegas and has a very intimate and dark “old-style” atmosphere. There’s a bar seating area with a small TV as well. My experience here started at a low but ended with a high, all the way thru the roof! I only had one thing here because I was sure I wouldn’t be able to finish anything more: Medium On The Bone Prime Ribeye (21oz for $69) complemented with Seared Foie Gras ($14) and paired with Vina Alicia ‘Paso De Piedra’ 2008 Cabernet. I was surprised how small the foie gras was for $14, and it wasn’t even that thick to compensate for the smallness. Despite that, it was perfectly seared and really had a strong flavour. What I also love is that they placed it on top of the steak so the foie gras juice went to the steak too. That sort of made up for the size. For Ribeyes, my favorite part is the Ribeye Cap which tastiest and fattiest part of the steak (in the above photo, this is the bottom most part). And always pair your steak with red wine! It was my first time trying this Argentinian wine and I really liked it. I start cutting into it but it wasn’t as tender and marbled as it should from a great steak. 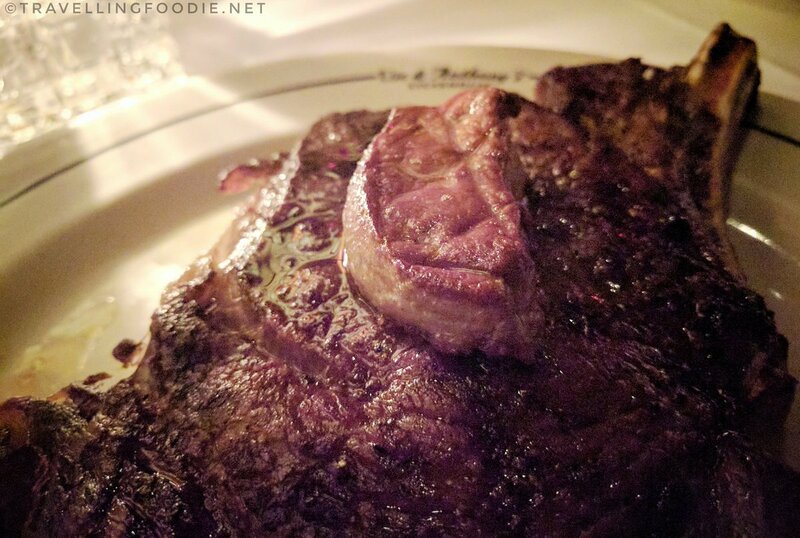 I didn’t let it bother me too much so I continue eating until I reach the non-Ribeye Cap parts, and it was pretty tough and little to no marbling, which reminded me a little of my experience at Public House at The Venetian. Up until this point, my server has not come back to check-up on me yet. I debated whether to wait or continue eating as he tends to other tables (maybe he forgot about me because I was dining alone). I decide to continue eating in case he doesn’t check-up on me as I don’t want my food to get cold. By the time he does, I was 1/3 into the steak already. I told the server I found the Ribeye quite tough. He says “Ok” then leaves. Thinking nothing’s happening, I continue eating. The manager then arrives, informs me that my server has brought up the issue with him and apologizes that the steak was very tough. He asked if I wanted to replace the steak or change the order altogether. I chose to replace the steak because I really do want to try what their proper ribeye would taste like – I did say Medium Rare to keep it on the safer side this time. The second steak was brought by the manager who asked me to check the steak while he’s there to make sure everything’s okay. I cut thru the middle and, boy, was it so much different. In the cut alone I already felt the tenderness and the marbling of the meat. And that was just in the middle part (see photo above – sorry for the bad photo as it was really very dark inside!). Imagine my ecstasy as I ate the melt in your mouth Ribeye Cap. This is exactly what I have been looking for, and to me what a Ribeye should be. One thing I wished though is they provided the seared foie gras as well as part of the replacement. I actually mix the foie gras with the steak too to enhance the taste so I was sad the foie gras was wasted on the first steak. But ah well, I can’t really complain at that point when I was already in Ribeye Bliss! Have you tried other Downtown Las Vegas Steakhouse? How does this compare? Posted on January 24, 2017 by Travelling FoodiePosted in Food, Las Vegas, Nevada, USATagged restaurants. Thank you so much for pointing it out. I have changed the url. Thanks!